Originally published April 8, 2013. Updated with new pictures on March 15, 2017. 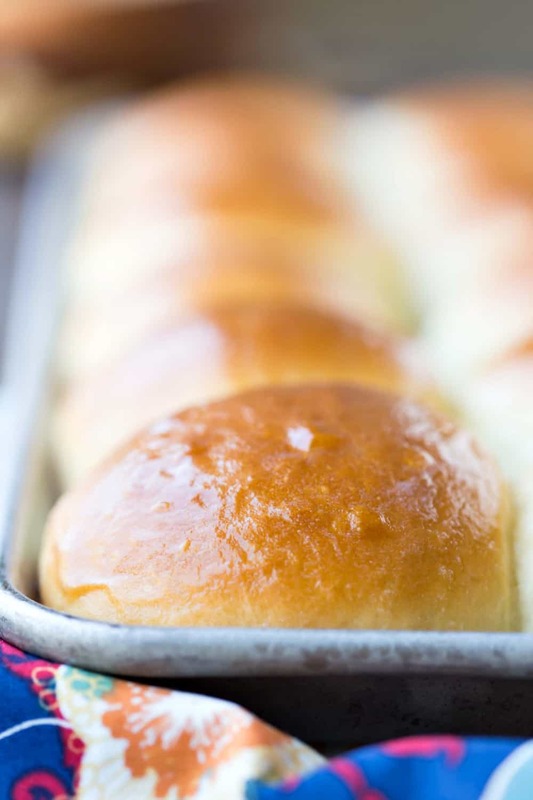 Make your own copycat version of Hawaiian Rolls at home with this easy, made-from-scratch recipe that’s sure to please! This recipe is such a favorite in our family that I wanted to re-share it with those of you who missed it the first time when I shared this recipe almost four years ago. 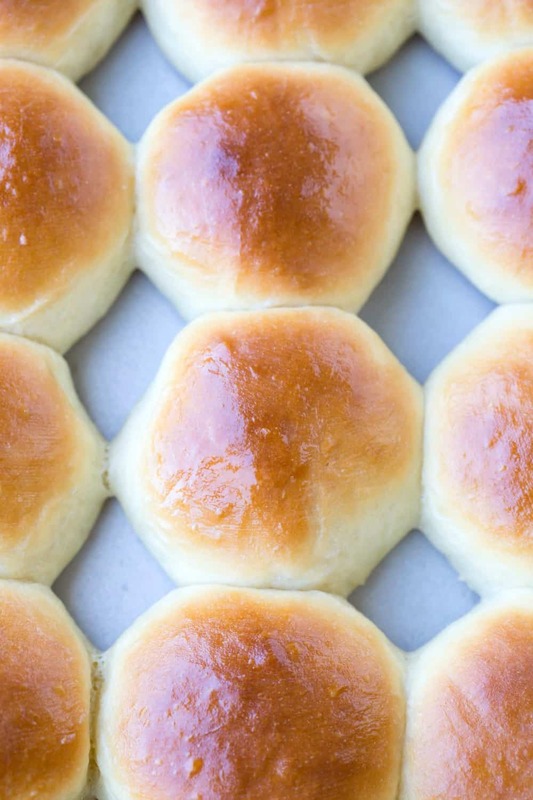 Hawaiian rolls are quite possibly the most delicious rolls ever. They are soft and buttery and sweet. They pair beautifully with ham dinners. There’s something about the sweet fluffy rolls and the salty ham that just works so well. So, these rolls make fantastic buns for baked ham and Swiss poppy seed sandwiches. They are also really easy to make! These Hawaiian rolls are my family’s favorite rolls. We have them at Easter and at Christmas every year. Any time that I ask my son what he’d like me to make, he always says Hawaiian rolls. I hope they become a favorite for your family, too! I’ve also made these rolls with all-purpose flour when I didn’t have any bread flour. I had to add about 1/2-1 cup additional flour for a total of 6-6 1/2 cups of flour. While I haven’t tried it, I have heard from people who have successfully used measure-for-measure gluten free flour in this recipe. If you’ve tried this Hawaiian roll recipe, don’t forget to rate the recipe and leave me a comment below. I love to hear from people who’ve made my recipes! You can SUBSCRIBE to receive my latest recipe newsletters or FOLLOW ME on FACEBOOK, INSTAGRAM and PINTEREST for even more delicious food. 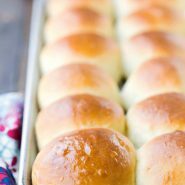 Make your own copycat version of Hawaiian Rolls at home with this easy, made-from-scratch recipe! In a small saucepan, heat pineapple juice over medium-low temperature until juice reaches about 105 F.
In the bowl of a stand mixer fitted with a paddle attachment, stir together yeast and 2 tablespoons of sugar. Once the pineapple juice is at temperature, add to the bowl. Stir, and let the yeast mixture stand for 5-10 minutes, or until foamy. Once the yeast is foamy, add the remaining sugar, butter, vanilla extract, and eggs; stir to combine. Switch from the paddle attachment to the dough hook, and add 3 cups of flour and salt. Stir on low. Continue adding flour 1/2 cup at a time until dough clears the sides of the bowl. The dough will feel slightly sticky. It takes 5 1/2 cups of flour for my rolls. Once the dough comes together and clears the sides, continue to knead for about 1 minute. Cover bowl with plastic wrap, and let it rise until dough has doubled in size, about 1 1/2 hours. Shape dough into rolls. 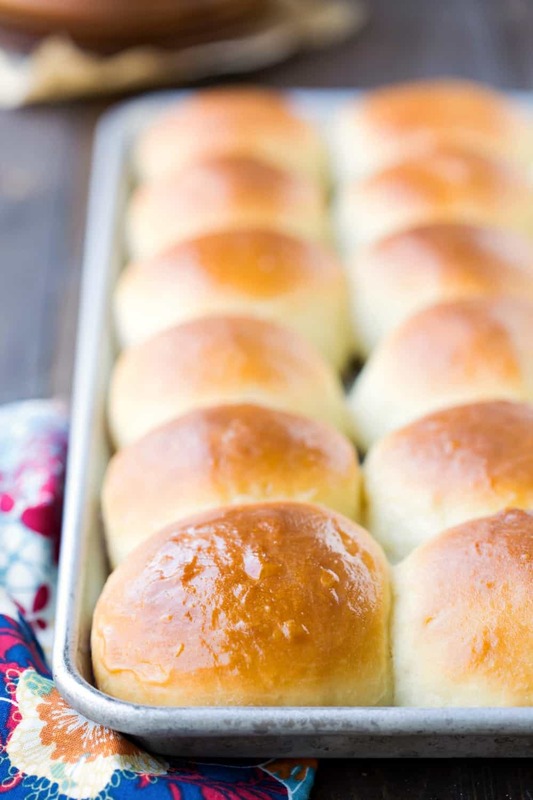 If you would like smaller, dinner-sized rolls, shape into 24 rolls. If you would like larger, bun-sized rolls, shape into 12-18 rolls depending on desired size. Cover rolls with plastic wrap, and let rolls rise until doubled, about 1 1/2 hours. Toward the end of the second rise, preheat oven to 350 F.
Bake rolls for about 20 minutes (for dinner-sized rolls), or until rolls are golden brown. Immediately brush rolls with butter. *I've also made these rolls with all-purpose flour when I didn't have any bread flour. I had to add about 1/2-1 cup additional flour for a total of 6-6 1/2 cups flour. Would canned pinneapple juice work (the juice in a can of crushed?) and could you add the pineapples in the recipe (like crushed) be good? Just wondering if juice would be sweet enough? OMG!!! These are the best rolls EVER!! I made them and was only able to eat one because everyone else devoured them. Do you know if I can sub gluten free measure for measure flour? Yes, I believe that I’ve heard from people who have successfully substituted gf measure for measure flour in this recipe. Can I use instant yeast instead? Yes, instant yeast should work just fine. Hi! I’m definitely going to make these but what is bread flour? I’ve never seen it before. Thanks! ? Bread flour is a type of flour that has more protein than all-purpose flour. It’s used in bread, rolls, and even cookies to give a little extra chew. It’s sold right alongside all-purpose and whole wheat flour in most supermarkets. I used a food processor to mix everything and it still turned out great! You should try substituting the low fat milk for coconut milk, that’s what I did and it makes the flavor more complex. I did not see any kind of milk in this recipe. Am i missing something.